This beautifully made shaving set includes the Rosegold handle version of the worldwide top selling safety razor the mild shaving yet very effective Muhle R89. Suitable for beginners and experienced safety razor users and all skin types including those with sensitive skin. 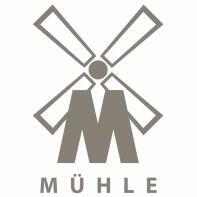 Muhle manufacture the most amazing shaving products from their factory in Germany, using high quality materials incorporating fuss free, design lines. The barrel shaped shaving brush benefits from ultra-soft, Synthetic Silvertip fibres. As well as the same astonishing rose gold plating as the razor handle. This brush will lather up shaving creams and soaps with ease. The stand has a 60mm footprint and is 70mm tall; it's highly polished to a mirror finish which matches the brush and razor perfectly. THIS SET IS ALSO AVAILABLE WITH THE R41 RAZOR WHICH IS MORE AGGRESSIVE THAN THE R89, PLEASE CONTACT US IF YOU WOULD PREFER THE R41 VERSION. Razor: R89RG model, 85mm long handle, closed comb. An attractive and mild razor with flawless rose gold plated handle. Synthetic Silvertip Fibre brushes are as soft, if not softer, than Silvertip Badger hair. With the added bonus of fast drying and being 100% vegan and animal friendly. Stand: Metal alloy plated in shiny chrome. We suggest you watch our tutorial 'how to shave with a safety razor video' before you shave for the first time with this razor. Look after the shaving brush and you'll get many years shaving pleasure from it, read this Blog post on 'shaving brush care'. The perfect set for a beginner or seasoned wet-shaver alike. Muhle have incredibly stylish and high quality designs, always value for money. Muhle razors are known for being exceptionally comfortable whilst being very efficient at removing stubble.